Wound Salve is an all-natural, herbal, topical salve in a white beeswax base. It includes tea tree oil as well as many special herbs, flower essences, and natural topical antiseptics. Each batch is made by hand by extracting herbs, creating colloids, emulsifying and blending it all together in an earthy suspension with a delightfully earthy scent. We carefully selected a combination of nature-derived oils and waxes that each have their own healing benefits while creating a smooth texture and moisturizing application: Olive Oil, Beeswax, Castor Oil, and Cocoa Butter. 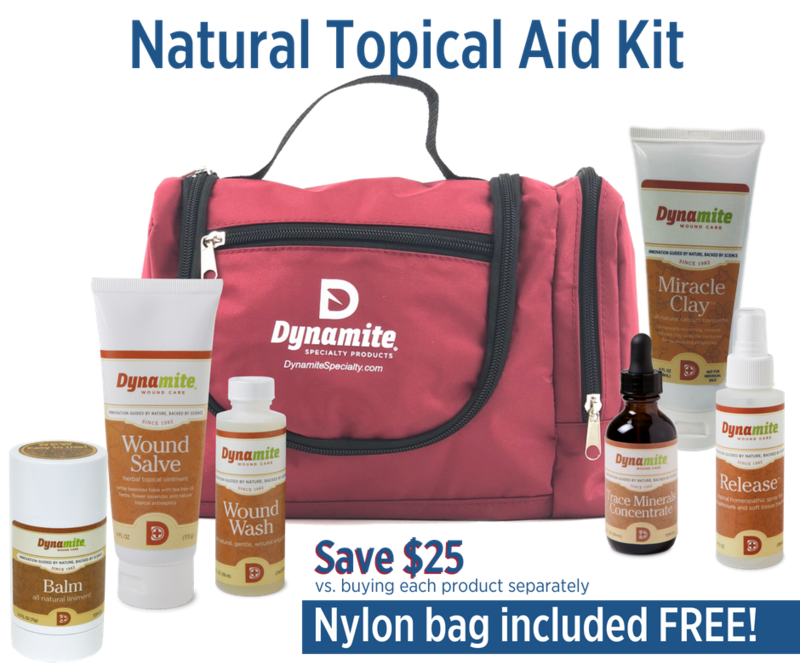 Many companies have successfully marketed these oils separately as the sole ingredient in their healing products and Dynamite uses all of them! Black Walk Hulls – Black walnut contains high concentrations of chemicals called tannins, which can reduce pain and swelling and dry up body fluids such as mucous. Additionally, it has been used as an anti-parasitic and in this formula will discourage parasites from the wound. Myrrh Gum – Used to reduce swelling. The ancient Chinese used this herb to treat wounds and bruises; it is still used as a broad-spectrum antiseptic. Chamomile Flowers & Leaves – Widely used to treat inflammations of the skin and mucous membranes, and for various bacterial infections of the skin, oral cavity and gums, and respiratory tract. Equisetum arvense (Horsetail) – Contains silicic acid, saponins, flavonoids, sterols, tannins, potassium, aluminum salts, manganese, magnesium, sulfur and calcium. Historically, horsetail has been used to stop bleeding, repair broken bones and as an herbal remedy for arthritis. Wheat Grass Extract – Concentrated source of nutrients, containing vitamin A, vitamin C, and vitamin E, iron, calcium, magnesium, and amino acids. Additionally, it contains chemicals that might have antioxidant and anti-inflammatory (anti-swelling) activity and a chemical that might fight bacterial infections. Blessed Thistle – Has antibiotic properties due to the substance cnicin, the essential oil and the polyacetylene found in the plant. Ginkgo – Used topically for its antibiotic effects as well as its collagen-stimulation. Red Elecampane Root – This plant has a long history in veterinary medicine as an effective remedy for skin diseases. Garlic – topical application of garlic extract can potentially be effective on psoriasis, alopecia areata, keloid scar, wound healing, cutaneous corn, viral and fungal infection, skin aging and rejuvenation. Cayenne -Primarily studied for it’s anti-fungal properties when used topically. But there are indicators that it also stimulates circulation, encouraging healing. White Oak Bark – The key component of the white oak bark is tannin, which gives it its astringent and antiseptic properties. Valerian Root – Historically, used topically for skin problems, rashes, bruising, and for sore muscles. Yellow Dock – Yellow Dock contains chemicals that might kill parasites, bacteria, and fungus. Honey Bee Pollen – Bee pollen can be used topically to speed up the healing process, especially useful as a home remedy for burn relief. The pollen includes kaempferol, which inhibits the activity of enzymes after a burn and decreases inflammatory reactions and swelling. Pollen helps improve blood circulation in the vessels, and it moistens the skin. The anti-inflammatory and analgesic action of flavonoids in bee pollen helps relieve pain and prevent platelet aggregation. Pollen also helps prevent infection because of its antimicrobial activity, allowing a wound or burn to heal quickly. Sulfur (MSM) – When used topically, MSM is helpful in treating skin disorders including acne, psoriasis, eczema, dermatitis, dandruff, scabies, diaper rash and certain fungal infections. Scars resulting from operations and from burns also respond well to topical application. New scars can heal so perfectly that they are almost invisible. Old scars, too, can improve markedly. Propolis (known as “bee glue”) – Pinocembrin, is a flavonoid component of propolis that acts as an anti-inflammatory and antimicrobial properties, making propolis helpful in wound healing. 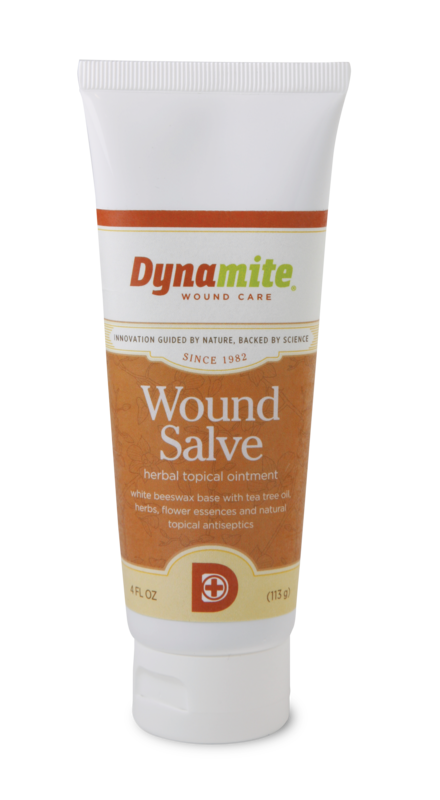 Wound Salve comes in an easy-to-squeeze 4 ounce tube. Because Wound Salve is designed to melt at body temperature, please store it in a cool place to avoid it turning into liquid and potentially making a mess.